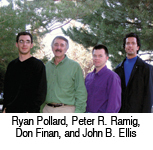 Ryan Pollard, John B. Ellis, M.S., Don Finan, Ph.D., and Peter R. Ramig, Ph.D.
Electronic devices that deliver altered auditory feedback (AAF) have been used for several decades to help reduce stuttering (Bloodstein, 1995). 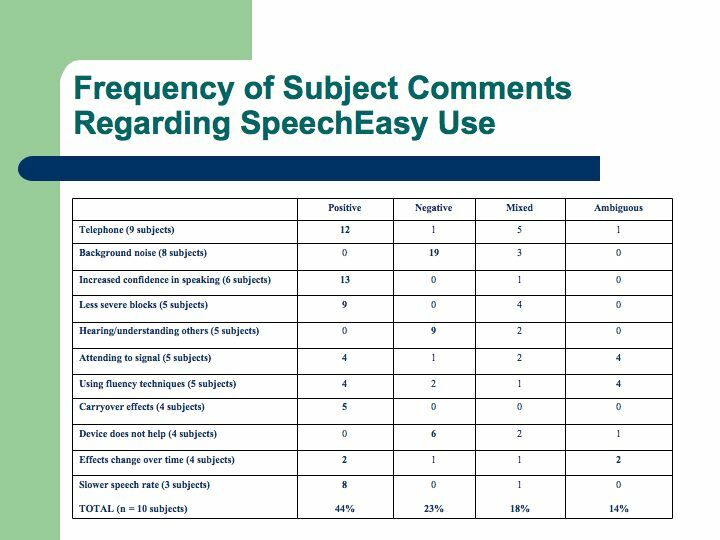 The SpeechEasy, introduced to consumers in 2001, is one of the more recent AAF devices available to individuals who stutter. In contrast to the often conspicuous and cumbersome nature of earlier electronic fluency aids, the SpeechEasy is comparatively small and cosmetically pleasing, and thus more appealing to some consumers. Recently, researchers at the University of Colorado at Boulder examined the effects of the SpeechEasy over six months of continual use. The purpose of the project was to gather Phase I treatment outcome research about the SpeechEasy in more naturalistic settings. Unlike previous SpeechEasy research (e.g., Stuart et al., 2006), this study collected periodic speech samples outside of the laboratory to more accurately assess the device’s real-world effectiveness. Subjects were recorded while reading aloud, conversing with a researcher, and asking a question to a stranger. After a month-long baseline phase, subjects wore a custom-fitted SpeechEasy device for four months. After this treatment phase, subjects continued to be monitored for an additional month without the device in place. The SpeechEasy was generally effective in reducing stuttering when immediately fit, but significant reductions in stuttering were not consistently maintained across four months of treatment. Relatively more stuttering reduction occurred during oral reading than during the conversation or question tasks. Individual responses varied greatly with regard to both fluency improvement and personal impressions of the device. For example, many subjects reported that a promising feature of the SpeechEasy was its effectiveness while using the telephone. In contrast, the most frequently reported drawback was perceived background noise in certain situations (see Table). At the end of the study, subjects were then surveyed in order to gain insight as to their satisfaction with wearing the SpeechEasy. Regarding ultimate purchasing decision, four of the 11 subjects who began the experiment elected to purchase their devices at a substantial discount after completing the study. Three subjects did not purchase the device, but replied that they would continue to use the SpeechEasy if it were given to them free of charge. A final three subjects decided not to buy the device and reported that they would not continue to use it even if it were given to them at no charge. Although the group findings in this study revealed no overall treatment effect for the device, this is a qualified conclusion for several reasons. First, individual subjects did benefit from wearing the SpeechEasy during certain speech tasks and/or reported satisfaction with the device, indicating that the SpeechEasy may be viewed as a viable treatment option by some who stutter. Furthermore, the subjects who participated in the study sampled their devices at no cost and may have conceivably been less motivated and emotionally invested in a positive outcome than those who actively seek out and purchase a SpeechEasy. Finally, subjects in this study were trained and encouraged to use active techniques such as easy vocal onsets or initial sound prolongations as needed to initiate voicing when wearing the SpeechEasy; however, additional stuttering therapy was not provided. Because recent clinical evidence indicates that including traditional stuttering therapy may improve SpeechEasy outcomes (Armson et al., 2006), it appears that in at least some cases, the expertise provided by a certified speech-language pathologist to provide additional stuttering treatment may be needed in order to maximize benefits derived from SpeechEasy use.